Spring break is the light at the end of the tunnel, the glorious reprieve in the middle of a grueling semester. But for most college students, an expensive and extravagant trip to Cancun or Las Vegas isn’t in the cards (or in the budget). That’s why we’ve put together this excellent list of ideas for a fun and cheap spring break. Read on! If you’re looking for an alternative spring break, try staying around campus for the week. Your housing is already paid for, so you instantly save money that way. Now’s your chance to have fun with your friends! Try exploring local attractions, like spending a day floating the river, relaxing by the lake, or hanging out at an amusement park. Eat at a dive restaurant you haven’t tried, or cook new recipes with your friends. There are plenty of ways to have a wonderful and cheap staycation for spring break; you just have to think outside the box! If you’re looking to get away from campus for the week, try camping as a less expensive option. In fact, don’t just camp, try DIY glamping! Consider renting a yurt for the week, and find a campground with full bathrooms and hot showers. You can borrow gear from your friends, or see if your school has a rental program. Now you add the glam! Bring lots of delicious food, an air mattress, comfy bedding, or a hammock! It’s the little luxuries that make glamping amazing! Make sure you find a good campground with plenty of fun activities around. Whether you spend the week hiking, swimming, fishing, or lazing around in the sun, glamping is the way to go! If you already have plans to go away somewhere, have no fear; there are plenty of ways to save money on vacation. Limit your dining out. Instead of eating at restaurants every night, make a grocery store run and get food that will last you the week. You’ll instantly save on meals, snacks, and beverages. Use your student ID. Countless businesses give out student discounts. Don’t be afraid to ask if they have any, and start flashing that ID card! Travel on the cheap. Instead of flying, consider taking a Greyhound or train to your destination. Search the deals and save your money for fun activities. 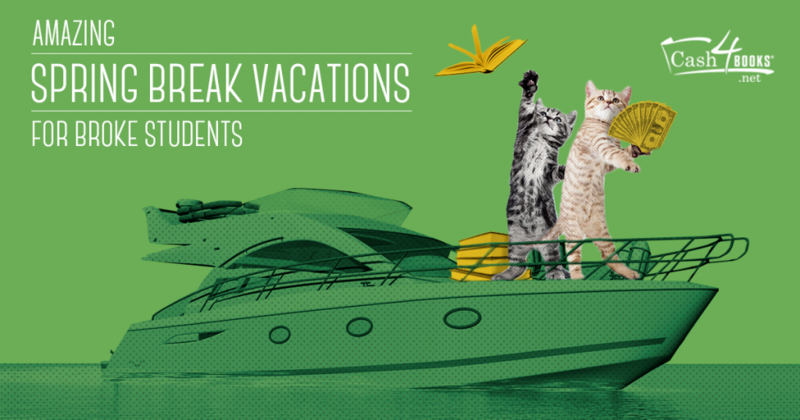 A fun spring break doesn’t have to break the bank. Think outside the box and save some cash. Still need ideas on saving money for your trip? Take a look at our tips for making cash, and sell your used textbooks here! This entry was posted in College Students and tagged college students, Save money, Spring Break, thrifty, tips, Travel on March 9, 2016 by Jim McKenzie Smith.